When I broke the news on Monday that US publisher Houghton Mifflin Harcourt might have signed an agency deal with Amazon, I said that I didn't think it had happened _yet_, and I advised that this story was worth watching. It looks like I was right on both accounts. Publisher's Lunch caught the story Tuesday. They don't have an inside source (I was hoping they would, darnit) but they did notice the declaration you can see at right. After looking at ebook prices across retailers, PL reported that the deal had gone down. I've reviewed the prices of HMH ebooks in iBooks, Kindle, Kobo, Play Books, and Nook stores Wednesday morning, and I can confirm that the prices are considerably more consistent than they were on Monday afternoon. With the exception of Kobo, which sometimes showed a significantly higher price, all of the major ebook retailers showed prices within roughly the same range. The prices were generally with 20% of each other and of the (assumed) retail price. And so, I think it is safe to say that Houghton Mifflin Harcourt has struck a new contract with ebook retailers with terms similar to the contracts that the Big Five (Hachette, Macmillan, S&S, HarperCollins, and Penguin Random House) signed over the past 10 months. We do not know the terms, but the contracts do appear to limit discounting from the price set by the publisher. At this time the common name for this type of deal is Agency Lite. I hope I'm not the only one who wonders why HMH signed this deal in 2015. This publisher is bigger than S&S, and yet HMH has not pushed for a similar deal in the five years since the first agency deals were signed. But now they have an agency contract. That is, and I'm not exaggerating here, an important turning point of some kind. 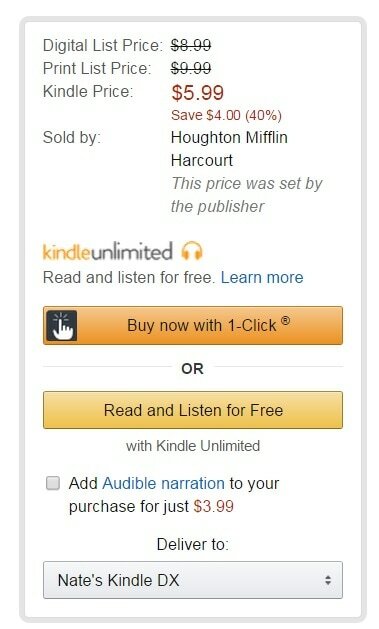 I wish I knew what was going on behind the scenes, because something just changed in the US ebook market. If you have a contact, go ask them what's going on (I have thumbscrews, should you need them). What has changed is that nobody is ganging up on Amazon. What has changed is the interoperable epub is almost irrelevant in the US. Also note, the $5.99 price is well within Amazon’s pricing guidelines. Plus it’s a 33% discount off the nominal list, 40% off the pbook list. Remember, the crime of the Agency cartel was conspiring to raise prices. DOJ made it clear that Agency alone was not forbidden, especially if negotiated quietly and professionally, without public catfights. More seriously: have are new-release HMH hardcover edition ebooks priced? The sticking point on ebook prices, going back to the pre-Kindle era, has always been the insistence on pricing like hardcovers when they are more generally paperback substitutes. Without resale value. The clamour has always been for sub-paperback pricing, so *if* that $5.99 price is a typical example, then we’re looking at a win for readers. Also, looking at it from the author point of view, a $5.99 ebook will deliver $1.04 in royalties which is (slightly) higher than they get from the $8.99 paperback. Now, if the Hardcovers are priced at $12.99 instead of $9.99, then things are going to be different but as the emerging evidence suggests, going that high is going to mean less sales. Either way, Indies win and Amazon wins. If tradpubbers want to hang themselves, Amazon will sell them the rope. At a nice profit, of course. It stays below the optimum pricing guideline! This is amazing. What alternate universe are you from? Indies do NOT get to “get to set their prices.” Indies are forced into Amazon’s $7 Stalag prison which prevents them from bundling, omnibusing, etc. This relentless flacking from AAAG (aggregated Amazon ankle grabbers) does Indies a massive disservice. This pricing may be part of, or required, due to the MFN clause. HMH sells mostly textbooks and educational materials directly to school districts and MFN may require standardized pricing across all channels. Or one of the Big 5 secretly bought or controls HMH. This is the same company that declared bankruptcy in 2012 to wipe out $3.1 billion of debt. They’ve reported huge losses every year since then. Their latest quarterly report’s losses are worse than Nook’s. If anybody were to buy HMH, the top candidate would be Pearson. Probably in combination with Amazon, with Amazon getting the trade books and Pearson the educational side. I found 323 books published by New Harvest on Amazon and 9940 published by Mariner. I forgot to add that the New Harvest figure is for paper only and the Mariner figure is for all editions. This is the that deal was supposed to put Amazon published titles in physical bookstores. Do you remember reading about indies and B&N refusing to sell Amazon’s print books? This is the deal that inspired that response. Indies said no, and B&N said Hell, No (and yet everyone is angry about Amazon letting Hachette stock run out). Yes, I remember. Going a bit off topic- Did Sterling (BN) sell off their adult fiction line at some point? Their site is down. I can remember back when Sterling wouldn’t sell in the kindle format or at least that is what we were told. B&n was going to sell Sterling at one point, but I don’t think that ever happened. And I don’t recall Sterling selling a part of itself, either, but I could be wrong. I suppose B&N would prefer to torch it rather than sell for for pennies on the dollar. Or Pearson-Bertelsmann, with one taking the textbook part and the other taking the trade, which would be rolled into PRH. Yes, Pearson would be a good candidate. Possibly Scholastic.